I love Mata but I struggle to see exactly where he fits. If we play a 4-3-3 he doesn't fit because at all except for being 3rd or 4th choice on the right. If we play a 4-2-3-1 (which really constrains Pogba) I can see him behind the striker but if we sign another forward on the right (and I know that's a big if) he really won't have a place because I reckon Mourinho would move Lingard or maybe Alexis into the no.10 role before Mata. He made 40 appearances for us last year, 42 the year before that. Until we sign more players in his position it's safe to say he'll play plenty. A decent squad player. Fits playing against the minnows at home where we dominate the ball. Can also make an impact off the bench. Sad to say it but I think he regressed a lot last season, used to be reliable for having good movement and finishing his chances but even that was starting to drop last season. At 30 years old it's not impossible we'll see an improvement this year, mind. Impact sub and a good one to have. He knows being a squad player is better than Turkey or Everton or Valencia. Kagawa,Mata& Mkhi. Why is that? They flourish at different clubs in this league, is it the way our teams set up I wonder. Would really like to transition him into a midfielder if we are to play 3 in the middle. Mata is a midfielder. Often plays as an attacking midfielder deployed into wing roles. It pains me to say it but he was really poor last season. If he's gonna stay then he needs to do a lot better. Can't have another season of him on the right. Season after season of this not working isn't acceptable. Even the players looked fed up with it. We seemed to not even bother playing on the right side last season. I think we should try urge him to find a good club which has a good role for him. He is a good guy and has won us some games, but he does not have a role at the club. He's too slow, can't shield the ball and can't really tackle. CM is not a good position for him in the long term. 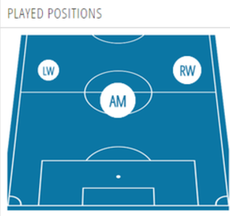 In a 4-3-3 the only position he has is on the wing, but he's not great at that either. He needs to go unfortunately. Many would of said the same of David Silva before Pep moved him infield. Pirlo was slow, not the strongest to shield the ball and couldn’t tackle either. Its more the playstyle. Wouldn't work in a 3 man mourinho midfield but would probably be fine in a Pep midfield. Was fine even in a Van Gaal midfield when we used him as part of it. With Mourinho's style where we defend deep a lot though, he really isn't suited to a central midfield position. Needs a position that doesn't require him to be near both boxes. Just doesn't have the pace to transition on either side of the ball. So, I actually see him moving more advanced, not into midfield. Likely as impact sub, especially if we're losing or drawing so not on the break. David Silva is in a whole different league lets be honest. He shields the ball better than anybody, and he rarely has to chase people up and down the pitch because City press so well. 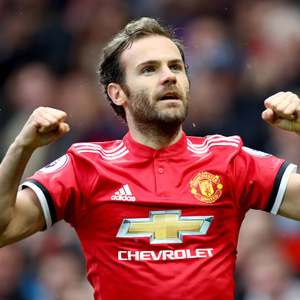 Mata could do a job against the lower league teams, but he'd be no better than Pogba /Lingard in that positon, so whats the point? were just downgrading for the sake of putting him in the team. He was our worst attacking minded player last season. I'm amazed Jose has kept him on. Would probably be a bad idea to do that before we signed someone to play on the right. He had a poor season last time round, hope he starts strongly and has a good one this time round. Great player to watch on his day. What ? David Silva isn't afraid to play dirty at all. Mata will be a disaster in midfield. The first goal we conceded against Huddersfield when he lost the ball will be seen many times, while you'll never David Silva getting pushed that easily. I meant just in general. He got rid of him quickly at Chelsea when he was a much better player than now. But he's kept him for 3 seasons now. His best days were a good few years ago sadly. Probably true. Still, as one of our senior players (!) he’s definitely still got a lot to offer, on and off the pitch. Mata's rapid decline really started when LVG used him some games in CM. He seemed to cut all the risk out of his game and just try to keep the ball all the time, which is how we were playing under LVG. When he moved back out onto the wing he didnt change and thats pretty much his playstyle still to this day. Keep the ball but dont look for many chance creating passes like he used to. Great guy for sure, always gives his best and frequently amongst our best performers but we seriously need to be thinking of upgrading if we are going to challenge for anything. You kind of need good seasons from players like him if we are to challenge the league without further additions. He had a replacement in Oscar I think? We do not have a replacement for him right now. Mourinho's treatment of Mata didn't change much since his Chelsea days. He was fine with him in the team but just not a starter, a rotational player for Oscar and Willian that's all. Mata also isn't a permanent starter here and had several periods when he was out of the team completely and others when he plays. The only difference is Mata of Chelsea believed he can play as a starter for other top team and asked to leave. Now he's content with this rotational role as he's no longer at his peak, has declined and knows that he's not going to find any other better team to play for, and also loved by all fans so why not stay ? If he doesn't play a lot it's not a problem for him any longer. Should he still be here? Last year he was terrible. Began wasting chances which is strange because he was one of our more clinical finishers in the team. His build up play has always been average because he's weak and slow but Mata always had a calm head and knew how to finish. He's long past his best anyways so we should've been looking to move him on this summer. Surprised he's still here tbh. His days looked numbered when Mourinho arrived but he's somehow survived 2 seasons and is getting a third. 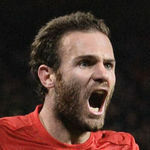 It's strange that Mourinho didn't like the better version of Mata at Chelsea but is happy to keep this version of Mata. Yes Oscar was preferred over him. I enjoyed his performance last night, but it was glaringly obvious that we can't play him on the right wing anymore. It's either no.10 behind the striker or nowhere, the lack of width on the right wing was a big problem when he was playing. I've always thought he should be in a role more central attacking, just behind a striker but we don't really use that role (maybe we should try it). He has probably the best softest touch of anyone on the team (along with Pogba) and he may still be brilliant at that role sitting behind Lukaku and Sanchez with 3 proper midfielders behind him (Fred, Pogba, Lingard, Matic, Herrera) expecting the pacy midfielders will provide some width along with our fullbacks. I'm uncertain what can actually be the key that unlocks our attack but he has uncanny vision and touch on the ball and his passes that when he touches the ball near the box, it turns into chances more times than not. Compare him on the ball relative to Martial, Rashford etc.. Vision and passing is an enormous deficiency in Martial and less so Rashford. The more I type this, the more I warm to the idea of a 4312 or a diamond midfield. I think Pogba and Sanchez could fill that role as well at the top of the diamond. We could use that creativity up front to provide service to our finishers. It could be a style all our own with the pieces that we have... I could really see this fitting. Bit of a messy goal, it was really interesting seeing him play up top as a sort of false nine. All 3 United His tinfoil hat protects him from the Glazers. He’s better than Lingard as a number 10, by a long way. Should be given the chance to play behind lukaku over a significant number of games. He's better than Lingard in creative passing but that's it. Lingard runs everywhere in free spaces to get the ball and pass it to others, always a passing option, doesn't take much time on the ball and has a good shot outside the box on him, but poor quality in making assists. I'll prefer Lingard on current Mata in number 10 anytime as Mata makes everything slow, but both aren't ideal permanent number 10 for us imo. Tbh this talk about Lingard being a better runner doesn’t really do much for me. I’d run my arse off for united if picked!! But what I actually did with the ball would be the bit that counted and believe me it wouldn’t be pretty! Running and moving fast after passing is imortant to make the build up faster and not giving the opponent a chance to react. Mata has a creative pass in him, but he makes everything slow and easy to defend against Imo.